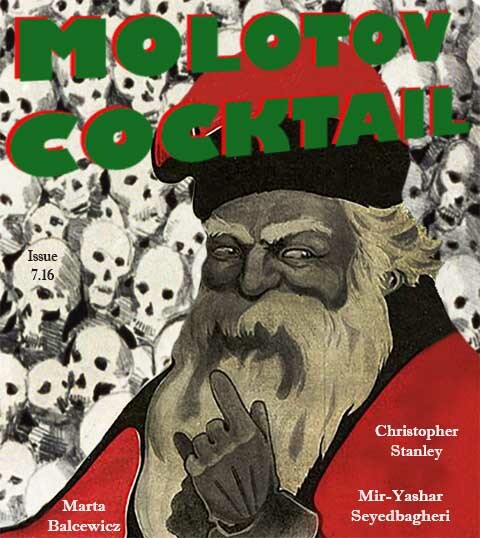 Issue 7.16 is all Naughty List. This issue features two close-but-no-cigars from past contests, and another piece by a Molotov veteran. We’ve got a Grim Reaper switcheroo, sinister forms of affection, and a macabre rug that really ties the room together. The release of our second-annual Prize Winners Anthology print issue is only days away. Contributor copies should go out before Christmas and, barring interference from gremlins, the anthology will be available for purchase by the end of the week. Our Flash Doom contest is also in full swing. Soft deadline is January 10th, so channel your sky-is-falling angst into an entry for a shot at cash prizes and publication in our Flash Doom mega-issue, which will premiere on Inauguration Day 2017, naturally.